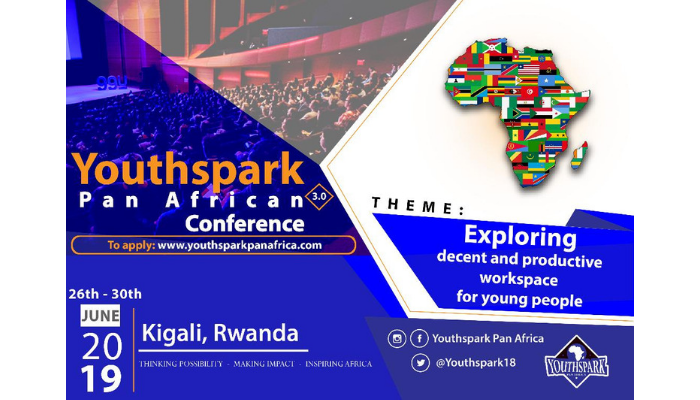 Applications are open for the Youthspark Pan African Conference 2019 taking place in Kigali, Rwanda from 26 – 30 June, 2019. Youthspark Pan-African Conference is a bi-annual Pan-African youth capacity-building programme designed for successfully selected youth to acquire valuable leadership skills and develop cutting-edge skills on transforming their ideas into profitable ventures. The conference will be selecting and engaging 100 innovative and development driven individuals across Africa. The main objective of the conference is to build the socio-economic capacities of entrepreneurs, leaders of organizations, and young professionals and given the opportunity to connect, dialogue and share ideas & strategies that can deliver accelerated problem solving and employment driven opportunities across Africa. The 3rd edition of the conference will be focusing on the Sustainable Development Goal 8 on the theme;Exploring Decent and Productive workspace for young people in Africa. Participants will however be responsible for securing any necessary visa and transport to and fro Kigali, Rwanda for the Youthspark Pan African Conference 2019. For more information, visit Youthspark.